After my first offer fell apart, I went back to the search. Nothing in Wildwood was capturing my eyes, so I looked a bit on the mainland. If money was no object, I'd be buying in Cape May. I love how Cape May is a historic district and they take care of their heritage. Their historic district guidelines are a mini course on Victorian architecture so they put lots of effort into understanding and protecting their past. Problem is Cape May is tapped out for unattached homes and unless you have 750K+, don't bother looking. But there are some pockets of old houses in the areas around Cape May that are worth investigating. I tried a place in Erma, but it wasn't interesting enough and full of cigarette smoke smell. Then a place in Cape May Court House came up. I scheduled time with a new agent to check that out. During that week, a couple of places came up for sale in Wildwood. Both houses were listed at very low 89K so there had to be issues with them. One of the listings was one street away from the first offer house. This house looked to be the same vintage and possibly built by the same builder. Very similar style, but a little bigger. 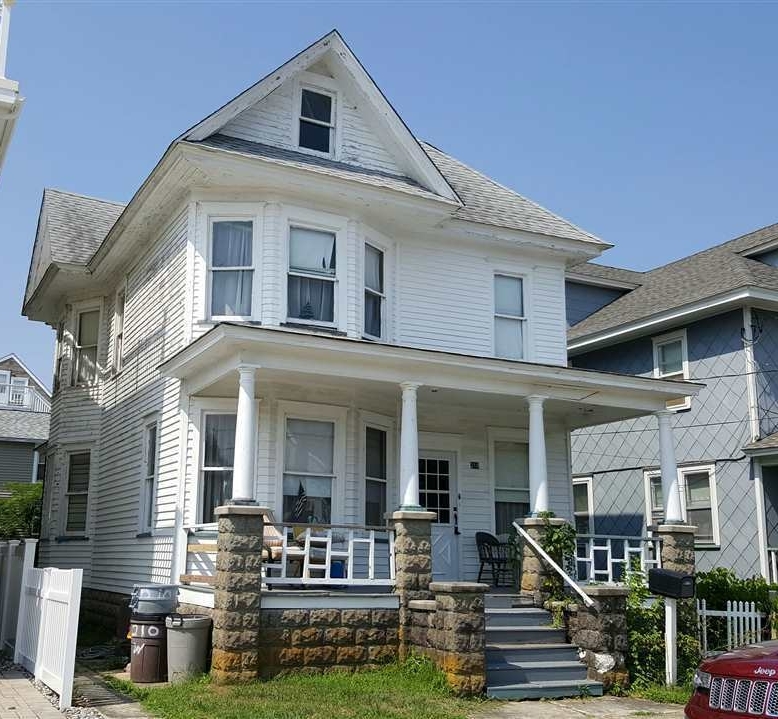 The description had no pictures of the interior, which is never a good sign, but I'm thinking this house will sit on the market forever like the rest of Wildwood, I come in with a low-ball cash offer and get a steal. Did you know that your dog is a valuable assistant in getting you the shabby chic look so popular today? First Wildwood house - at least they kept the original toilet. The Cape May Court House was OK. The town is cute with many old homes although it is a little carved up by the Garden State Parkway, Route 9, and strip malls. The house was a Victorian, but the deal breaker was the 2nd floor ceilings. They were so low that my head was almost brushing against the doorways when entering the bedrooms. I want to embrace the quirks of old homes, but I just can't do the low ceilings. So off we went to the Wildwood houses. The first one was completely gutted but it looked like work had stalled and they were giving up and putting the house on the market. The place was old but everything inside was gone so it wasn't really like buying an old house since I'd have to redo all the interior with sheetrock and new fixtures. First Wildwood house - one nice feature of this house is the pristine murder shed. When then headed over to the 2nd Wildwood house that was listed for 89K. The inside was packed to the gills with a hoarder living there. The first floor had a few paths carved out for eating and sleeping, but as you ascended floors, the more junk filled the house. The interior was a weird mix of 70s wood paneling and acoustic ceilings, but it also had all the original details such as doors, windows, hinges, and even a clawfoot tub. It was really rough, but also looked like it could be restored. Another late 1800s/early 1900s Wildwood house. Listed as built in 1899. All original windows and siding. I told the agent I was very interested, but wanted to think it over. She said she'd let the listing agent know I was interested and to keep us posted if an offer comes in. One week later, I go for a second visit with my spouse. Before the agent arrived, I see the caretakers of the house. They mentioned there was already an offer. Weird. Maybe they thought it was my potential offer. A second viewing shows lots of wear and tear, but lots of potential. Spouse gives the thumbs up so I email the agent my offer. She said the house is already in attorney review and I'd need to probably come in with cash at listing price or above. I stick with listing price and put the offer in. Turns out the seller received multiple offers so they cancel attorney review and ask for all final offers in by noon of the next day. I stay with my original offer and wait for the result.